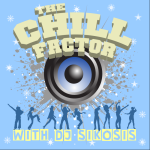 Season Greetings and welcome to a special episode of The Chill Factor. We're celebrating Christmas, New Years Eve, and the Six Year Anniversary of the Chill Factor today with a 3 hour mix featuring a ton of great deep house tracks from german label Plastic City and more. I'll also be dropping the usual chill, dubstep and dnb, so keep it locked, keep it chill. Kicking off with some experimental tracks this morning, followed by some house, dubstep and some great drum n bass. Starting off with some Drum n Bass this morning, then moving into some Dubstep and following it up with a bunch of Deep House tracks. So, keep it locked, keep it chill.